Goryokaku fort, a special histrical site at Hakodate City on Japan's northern island of Hokkaido, was Japan's first and largest Western-style fort. It was built in 1866 to house government offices for the administration in Hakodate and to deal with commerce and foreign affairs related to the port of Hakodate that opened to international trade in 1859. 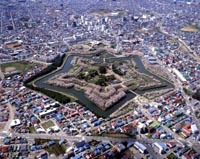 There are five V-shaped projections from a central core and it was named Goryokaku (Pentagram Fort) in reference to its star shape. Walls that rose about 5 m (5.5 yd.) surrounded an area of 251,400 square meters (about 62 acres). The projections, each of which has a battery at its point, were designed so that an assault from any direction could be met with concentrated firepower. During the Meiji Restoration in 1868, the reforms which put an end to the rule of the shogunate, a group of 3,000 people loyal to the old regime holed up inside the fort and resisted the new Meiji government. In the ensuing Hakodate War they held out for six months against an army of more than 8,000 before surrendered. After the war virtually the whole fortress lay in ruins and in 1872 the public offices were also demolished, with only the storehouse and the well remaining on the inside. The embankments, foundation stones, and moat are in a good state of preservation. 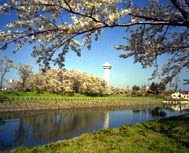 In 1913 the site was opened as Goryokaku Park, and is now famous for its flowering cherry trees. At the entrance to the park there is an observation tower that is 50 m (55 yd.) high. From here you can enjoy a stunning view and get a good idea of the layout of the fort.